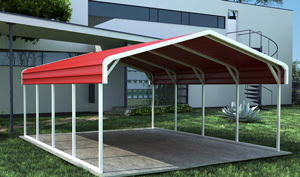 Our Carport Kits are a top seller around the country for good reason. Carport kits are a popular technique for building prefab carports for residential and business uses. They come in a broad selection of sizes and shapes. The expediency of being able to get engineered plans for permitting purposes, and of having all required parts delivered is very attractive. Here's a quick update on what's hot and what's not in the world of carport kits. What's Hot ; Partially enclosed carport kits. This type of is most practical for keeping less-used vehicles such as trailers, trucks and pickups. You can also purchase open metal carport kits large enough for two vehicles or mega tall to house an RV. Keep in mind that it's important to measure the site before buying a carport kit or ordering one online : Twenty foot wide carport kits. These carports offer a lot more room for two cars than their popular 18' cousins. With 20' wide carport kits you are able to open your car doors wider and it makes it easier for you to get in and out of your vehicle without having to be bothered about hitting anything. It's worth the higher price for what it offers the customer, though a lot of people are hesitant to look into a 20' wide prefab carport because of the fact that it costs a couple hundred dollars more than the 18' model. What's Not :Wood alternatives to steel prefab carport kits. Our won't shred in the sun and weather like a canvas carport can. Insects will not destroy a metal kit, and they pose much less of a fire hazard than the wooden variety. The pre engineered carport kits we sell can be delivered and installed for customers anywhere in the United States, they are made from durable materials that will weather almost any storm. For the protection of your car, boat or RV, get one of our steel garage kits or carport kits. They are incredibly practical and can be easily added to any residential or commercial site. Installation is easy and it comes in standard sizes or custom-designed to fit any application. Also our prefab kits are generally accepted as outbuildings, but we advise that you check for planning consent before you erect one.